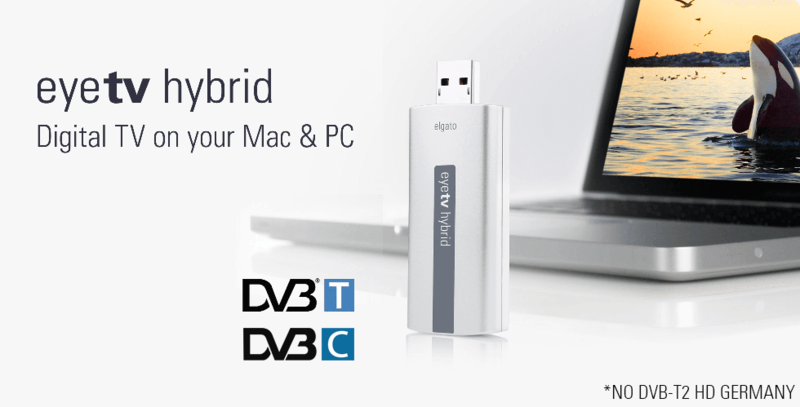 Watch, record, edit, and enjoy TV on a Mac or PC with eyetv hybrid. Superbly engineered and versatile, eyetv hybrid delivers free-to-view digital television to your Mac or PC via aerial (DVB-T, also known as DTT or Freeview) and cable (DVB-C). Despite its small size, eyetv hybrid contains a full-size and built-in coaxial plug and does not require an adapter to connect cable or an aerial. Simply connect the eyetv hybrid to the coaxial cable coming straight from the wall, or connect the eyetv hybrid to your TV aerial to receive the great variety of free-to-view TV programmes that are broadcast over-the-air. eyetv hybrid records digital TV in one quality setting, lossless. The digital stream is recorded unaltered for full quality digital content as encoded by the broadcaster. eyetv hybrid also supports multilingual programming and Dolby® Digital sound. With eyetv Version 3.6.8/3.6.9 in combination with the eyetv hybrid you can now receive digital DVB-T television using an aerial. You can use eyetv hybrid with a Mac or PC. eyetv hybrid is compatible with Windows 7 or later and includes the Total TV Player for Windows, which supports many of the same features as eyetv 3. With the Total TV Player and the eyetv hybrid, you can now receive digital DVB-T television using an aerial. Internet connection required to download eyetv 3 / THC/ Total TV software. Freeview HD, encrypted programs, analog television and DVB-T2 in terms of HEVC broadcasts are not supported. Pros: Tiny, easy to set up, included software does everything you could ask. Cons: Can't record encrypted content. Bottom line: If you live an over-the-air existence, the Hybrid is a savior. "... if you have limited space and you don’t want to deal with having a dedicated television and DVR, or if you would just like seamless integration between your DVR and your iTunes library, then you should definitely consider the elgato EyeTV Hybrid." "...if I was setting up a Mac Mini as a media centre, this is the first product I’d stick in the back of it." "The EyeTV has a ridiculous amount of functionality which I haven't even touched yet. As a straight up TV replacemant, though, it is outstanding --good quality and easy to use. There's also something neat about watching the telly on a laptop screen, and if a movie comes on I can just hit the "record" button, just like the old days of VHS."